The Hall was originally the seat of the local Government for Clarke Township. The lower level door to the south east, opened to the Clerks office. The office possesses a large walk in safe that held all the documents, and important papers of the Township. It remained locked until the early 1990’s when it was opened and the contents moved to City Hall in Bowmanville. The last clerk, Ed Millson, held his position for 30 years. When Regional Government came to the province the Town Hall lost it’s status as a government building. There was also a detention cell in the lower level, only ever holding one prisoner; a Russian named Danzubach. The cell did host many transients who needed a place to spend the night. It was removed from the Hall in the early 1950’s. In the year 1935 Mary Ann Harris bequeathed $1500.00 to the Hall, enabling the construction of what is now its clock and bell tower. The Main level looks much the same as it did when it was built in 1898: The wooden ceilings, wainscoting, and pine floor entrance; the balcony with its tiered seating, still with its collection of the original chairs; all overlooking the beautiful stage. Having excellent acoustics, the Hall has hosted numerous Concerts, School plays, Graduations, Band festivities, Christmas Carol sing along, Clarington Concert Band, Guitar showcases, Piano & Violin Recitals. Also Breakfast with Santa, Something Unique Craft & Artisan Show, Local Art Shows, Doors Open Clarington and Strawberry Socials. The lower level has been used by; the Gentleman’s card club, Auto Workers Credit Union, and The Orono Play Group. Because the Hall retained its Victorian feel, it has been the site of a few Motion Pictures. The Dead Zone, First do no Harm, and Dracula 2000. Also, the television program Wind at my Back, filmed some of its episodes at this location. In this, the Hall has seen such stars as, Pauline Johnson, John Candy, Meryl Streep, Gerard Butler, Christopher Walken and Martin Sheen. The Hall was mostly forgotten for quite a few years when a local citizen became a guiding force in the preserving of the hall. Ann Dreslinski was the Chair Person of the Hall Board for 20 years. Through her, money was raised and events planned; such as the Annual Spaghetti Dinner and Auction. Which has been a main fundraiser for over 10 years. The one hundred year anniversary event was planned in 1998, with the whole community taking part. A kitchen was added onto the hall in 2001, making the Hall perfect for wedding and community events. The Orono Town Hall is considered the Heart of Orono and is such a beautiful addition to the quaint Village. 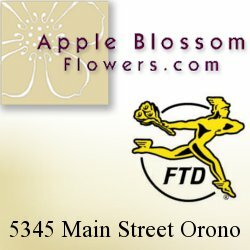 For more information on Orono please visit the official Village of Orono Web site.